Eating isn’t always a priority in college, especially when you’re too busy to even think about anything besides studying. Eating healthy can be even less of a priority because when you do decide to eat it’s more about what’s readily available or cheap. That’s why it’s important to have food (that isn’t completely terrible for you) stocked in your dorm room or apartment. To avoid the infamous freshman fifteen, you’ll have to resist the urge to order takeout for every other meal. While it is possible to eat in a responsible manner when eating out, it is far from cost effective. If you’re living on a tight budget grocery then shopping effectively will be a life saver. Yet still, I know I can throw off a well thought out budget if I go to the store without a plan. The solution to this problem is a grocery list. It’s easy to stay focused on exactly what I need and stay within my means when I have something to look at. I’m also trying to stay healthy by having a well-balanced diet filled with plenty of fruits, vegetables, proteins, and fats. Eating foods that are packed full of nutritional goodness will keep me feeling my best, so I can stay productive during college. Plus, it makes sense money-wise. A health conscious diet supports the immune system, this means less getting sick and saving money on doctor visits or medicines. Spending a little more on healthy food now will pay off in the long run, both physically and financially. Use phone apps, like BerryCart, to save on healthy food. This doesn’t mean that I have to completely cut out foods like pizza, ice cream or grilled cheese sandwiches. It’s more than okay to indulge in foods you crave. My motto when it comes to food is: practice moderation. As long as 90% of what you eat is in the “clean” or “healthy” category then you’re golden. Beans, Ground Turkey, Chicken Thigh, Chicken Breast, Salmon, Shrimp, Eggs, Tofu, Sardines, Cheese Sticks, Cottage Cheese, Tempeh, Chickpeas, Nuts, Bacon, Turkey Bacon, Greek Yogurt, Icelandic Yogurt, Ground Chicken, Tuna, Scallops, Crab, Lean Ground Beef, Pork Chops, Turkey Breast, Tilapia, Octopus, Dried Lentils, Jerky and Bean Chips. Kale, Lettuce, Tomato, Carrots, Cucumber, Zucchini, Squash, Seaweed chips, Spinach, Peppers, Celery, Mushrooms, Green Beans, Cauliflower, Asparagus, Broccoli, Snap Peas, Eggplant, Asparagus, Garlic, Cabbage and Sprouts. Orange, Apple, Blackberry, Blueberry, Raspberry, Banana, Mango, Tangerine, Watermelon, Cantaloupe, Grapes, Kiwi, Peaches, Pineapple, Pears, Persimmons and Grapefruit. Rice, Quinoa, Any Type of Potato, Oats, Whole Grain Pasta, Whole Wheat Tortillas, Granola, Whole Grain Bread and Barley. Chia Seeds, Avocado, Almonds, Peanuts, Pistachios, Cheese, Olive Oil, Coconut Oil, Avocado Oil, Flaxseed, Butter, Walnuts, Peanut Butter and Almond Butter. Kombucha Tea, Green Tea, Coconut Milk, Almond Milk, Rice Milk, Coconut water, Hemp Milk, Vegetable Juice, Black Coffee and Flavored Water. Dark Chocolate (60% or higher), Salad Dressing, Pumpkin Seeds, Chia Seeds, Honey, Hummus, Popcorn, Granola Bars, Seasonings and Low-Sugar Pasta Sauce. I eat a variety of different foods to ensure that I don’t get bored eating the same thing week after week. When I do have time to sit down for a full meal, I’ll include one source of protein, fat, starch/grain and vegetable or fruit. For snacks, I try to stick to things that will be digested slowly and keep me satiated longer. Things like: string cheese, sweet potatoes fries, nuts or oatmeal. Those who have ample storage and cooking space should consider food prepping. It does take some thought as to what will be eaten for each meal and snacks, but there are plenty of recipes on Pinterest if you’re not sure where to start. Meal planning is great because you do all your cooking for the entire week in just one day. That does sound like a lot of cooking, but it should only take 2 hours (maximum!). When there are pre-made meals ready, it’s easy to make good choices. Food prepping will save you time and money. Money that you might otherwise be tempted to spend on convenience items. The price of convenience is a hefty one over time. It’s not expensive to get into meal prepping; all you need is a pile of Tupperware (or containers like these), plastic baggies and a few hours you spare on just one day per week. You don’t even have to make every single meal in advance. Consider making just dinners that are easy to grab and take on the go. Having food that requires no extra work can be a giant relief during stressful finals. If you’re a complete food prepping beginner, this article is a good place to start. Do you want that list of food in a printable list format? Or maybe you just want a grocery list that you can print and fill in the blanks? 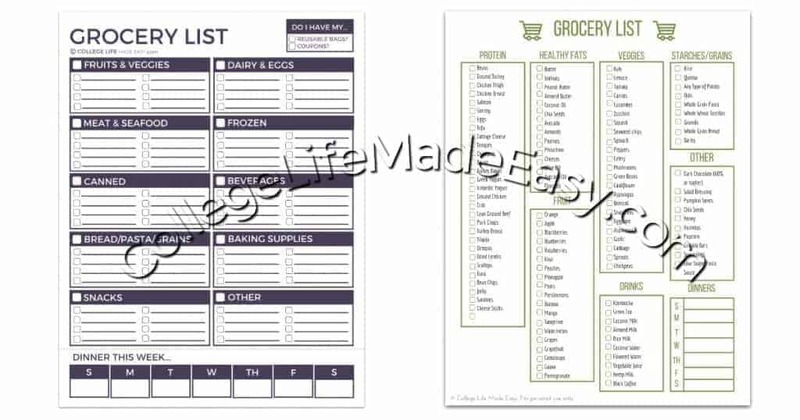 If so, there are two types of printable grocery lists available for free in in my Resource Library! There are a lot of other useful printables in there as well (and more to come). To use this library all you need to do is be subscribed to my newsletter. I send emails 3 – 5 times a month with tips on college life, budgeting and organization. You can sign up the newsletter here, or if you’re already subscribed simply enter the password to get these grocery lists right away. The password is at the end of every newsletter for future reference. Once you’ve downloaded the grocery list, it’s easy to print and then even easier to check off what you need while shopping. Depending on which list you decide to use, I would suggest circling or highlighting what you plan to buy before heading to the store. Or you could pick a few items from each category while picking up groceries. If you want to have a reusable list and save paper, try laminating the grocery list. Use a dry erase marker to check off what you get. Even keep it on the fridge and circle or write down what you run out of during the week. Sign up for the newsletter here or use the box below. You’ll then receive an email with a link to the Free Printable Resource Library + the password. Use that password to gain access to the Free Printable Grocery List and more! To download, just click on the picture. FREE Ken's Dressing & More at Target! 2 FREE Movie Tickets to See 'Silence' from Fandango!